The United States District Court for the District of Maryland is the only federal district court in the state of Maryland. It was established in 1789 by the Federal Judiciary Act of 1789. The Court convened for the first time in 1790 at Baltimore and alternated sessions between Baltimore and Easton until 1822 when the Court moved to the New Masonic Hall on St. Paul Street, Baltimore. The Court moved to its present Baltimore site in 1976. Congress created the Southern Division in 1988, and the Court moved to its present Greenbelt site in 1994. The District of Maryland has two divisions—Northern and Southern— sitting in Baltimore and Greenbelt, respectively. The Northern Division includes the City of Baltimore and the counties of Allegany, Anne Arundel, Baltimore, Caroline, Carroll, Cecil, Dorchester, Frederick, Garrett, Harford, Howard, Kent, Queen Anne’s, Somerset, Talbot, Washington, Wicomico, and Worcester. 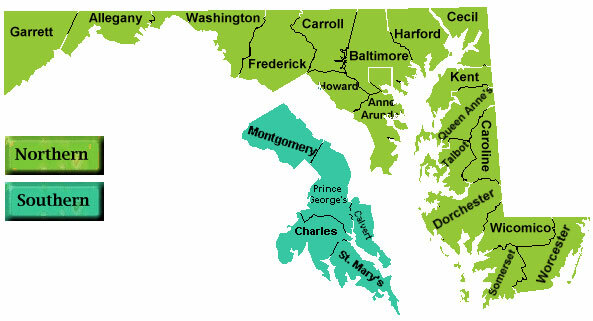 The Southern Division includes the counties of Calvert, Charles, St. Mary’s, Montgomery, and Prince George’s. Click here for a map showing the Court's two divisions. The Court also holds hearings in the federal building in Salisbury and at other government installations in Maryland, such as Andrews Air Force Base and Aberdeen Proving Ground.